What Type of Evergreen is This? Anyone know? It’s about 3′ tall and I really like the shape of it, but I don’t know if it grows that way naturally or if it was pruned. My guess is a Mungo Pine. I’m pretty sure they are mugo pines. We have some in our front yard. They are nice but right now are suffering from some sort of scale (fungus). a detail of the needle structure would be helpful. How many needles per cluster? how long are they? any cones on it? Hallie is exactly right it is a Mugo pine. I love them too, all year long. 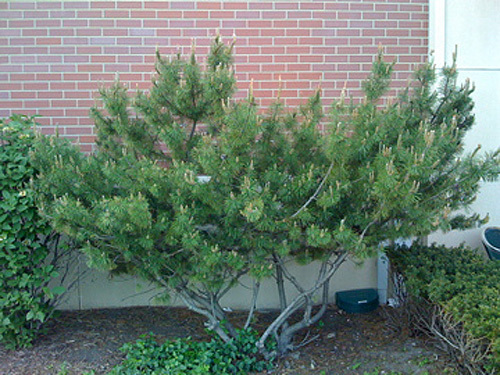 A mugo pine will grow branches all the way to the ground so if you like the way this one looks with the open branches at the bottom, pruning will be required. The general rule when pruning bushes is to make sure they are narrower at the top than bottom top to allow sunlight to reach the entire plant. And if you don’t want it get keep growing bigger, snap off those candles at the ends of the branches in the spring. Mugho (correct spelling) pine is correct. And it was pruned at the bottom, otherwise they are just kind of spread up from the ground in a, uh…bushy way. We have a number of them, and they are great plants. They also come in a dwarf variety. You can prune the top and sides of the mugo pine by simply breaking off one third to one half of the candles when they’re soft. The candles are those “candle-shaped” thingies that grow at the tips of the branches. My mugo pine is quite large so I tend to break off the entire candle. I believe it is a juniper and it will never fill out. But I could be wrong. I had a dear garden friend that said: if a plant is somewhere that you don’t like it, it is a weed. So yank it out. So if you don’t like it…. yank it out. Looks like a Mugho Pine, and it also looks like someone hacked at the bottom branches! :( They normally have branches at the bottom as well. I’m pretty sure it’s a mugo pine and that it was pruned. Thanks – I thought it might be some sort of pine, but I’m such a novice when it comes to gardening and plant identification. Never mind the shrubbery… Shouldn’t you be off somewhere, huffing and puffing and welcoming your beautiful baby?! I keep checking here, expecting to see news of the birth, and am met with shrubbery. I’m sure you’re more eager than we are though! I keep waiting to see if you’ve had that baby yet:-)! I do love that little tree/ bush, though. It has a great shape! pine schmine, where’s that bright eyed, and bushy tailed bundle of joy? looks like a black pine to me. Looks like a mugo pine. I had one in my front yard that had been let go for about 10 years before I bought the house. I spent weeks clearing out dead branches and pruning to make it look sort of like yours. It reminded me of a bonsai form and I really liked it, but eventually I gave up and tore it out. It had been allowed to grow unchecked for too long and it was horribly out of scale with the rest of the yard. Plus it was hiding a lovely japanese lace leaf maple. Bottom line, if you want to keep it that size/shape, prune regularly! No idea, but more to the point, do we know what kind of baby you have yet??? The baby is NOT HERE YET! I’m one week past-due now. It’s definitely a mugho pine. They are all over my neighborhood. If they are left to grow on their own they are out of control. Yours has obviously (to me) been pruned. Think bonsai! !